History is as people want to see it. Let’s look at John A. Macdonald’s role in the history of Canada. He was Canada’s first prime minister, is generally credited with forming the Dominion of Canada, the transcontinental railway, territorial expansion, and creating inducements for Europeans to settle in Canada. And, to honour his contributions and role in history statues of his likeness were commissioned, buildings and streets carry his name. But all of those achievements came at an immense cost to Indigenous Peoples; they did not happen in a vacuum. From the Indigenous perspective, John A. Macdonald, his ideas and policies had a tremendous impact on their identity, their children, their land, their sovereignty, their traditional lifestyles, and their culture. He was the architect of the residential school system in which 150,000 children were forcibly removed (of which 6,000 died), many of whom suffered severe physical, sexual, and emotional abuse. He was also the architect of the Indian Act, which continues to this day to control and constrain the lives of Indigenous Peoples. Some pundits wave away his policies of assimilation and cultural genocide with the excuse that “he was acting in the context of his time.” Yes, colonizers believed that the best thing possible for Indigenous Peoples was to remake them in the likeness of Europeans. But, it does not excuse how, when frustrated with the lack of progress of the assimilation policy, the Indian Act, under his leadership, became increasingly punitive and cruel. Being of a time does not make cruelty okay or acceptable at this time. There are those who want the statues removed. 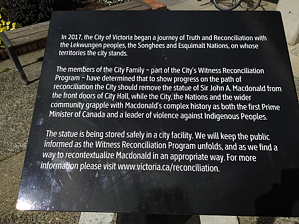 There are those who want the statues kept but with the addition of a plaque that provides some details of their participation in the cultural genocide of Indigenous Peoples. And there are those who believe the statues should be left as is and do not require a plaque. "The problem I have with the overall approach to tearing down statues and buildings is that is counterproductive to ... reconciliation because it almost smacks of revenge or smacks of acts of anger, but in reality, what we are trying to do, is we are trying to create more balance in the relationship. . . It is not about taking off names off buildings it is about whether we can find a way to put Indigenous names on buildings. . . It is probably a fight, had I been asked, I would have said to avoid it. . ."
The scope of the impact of the residential schools and the Indian Act must be recognized when discussing the legacy of the founding fathers of Canada. We should absolutely learn about them but not through a sanitized lense. As an Indigenous person whose family suffered deeply from the experience of the schools and the punitive and vindictive policies of the Indian Act, I am only too aware of the darker side of history and these statues are a painful reminder for me, my parents, and all my relations. In August 2018, Victoria council’s Committee of the Whole voted almost unanimously (7-1) in favour of removing the statue of John A. Macdonald from the entranceway of City Hall. "I'm proud to say that we are the party of Canada's first prime minister, the father of our federation, and the visionary who made this land possible," said Scheer. "I think it's a disgrace that we're allowing extreme voices in this country to erase our proud heritage." Canada is grappling with that “proud heritage” as it is the essence of reconciliation. To brand it as extremism doesn’t do reconciliation any favours. Nor does it align with the policy of our former Conservative prime minister Stephen Harper as it was he who issued the formal apology for residential schools and initiated the Truth and Reconciliation Commission of Canada. Talking about our past is essential, not extreme. The expanded perspective of historical figures is not unique to Victoria. In Halifax, a similar situation blew up over the removal of an Edward Cornwallis statue. There is a parallel discussion going on in our neighbour to the south. In that country, it is the removal of statues in the likeness of the Confederate generals of the Civil War. Some say they mark history and honour heritage. Others say they are racist symbols of America's dark legacy of slavery. "Sad to see the history and culture of our great country being ripped apart with the removal of our beautiful statues and monuments. ...who's next, Washington, Jefferson? So foolish! ...the beauty that is being taken out of our cities, towns and parks will be greatly missed and never able to be comparably replaced!" I believe we should remember these men, study their role in history, and derive what lessons we can from their accomplishments and their wrongdoings, which we can and should do without glorifying them. It has been said that we are doomed to repeat the past if we are not prepared to learn from it. Reconciliation is about coming to terms with the past, making amends, and learning from history so that we shape a better future for all our children. Reconciliation is not about erasing history. The removal of a statue of a historical figure is not an attempt to erase history. Statues such as these belong in museums, which is where objects of historical, scientific, artistic, or cultural interest are stored and exhibited. Visitors to museums make a choice about what they which exhibits they want to visit. I think a re-examination of history is positive and necessary; it keeps historical amnesia at bay. We will never achieve reconciliation if we pretend parts of our history did not happen or minimize the impact of the colonization of what is now called Canada. Let’s not make reconciliation a political football. Here's a sample of a Pledge of Reconciliation you can download.